Are we really in the 4th quarter of 2017? Where has the time gone? It’s been a full and busy nine months for us, and I am excited about all the new energy that is surrounding us in D’Adamo world! In the past year, we’ve updated our internal operating systems, restructured the company, and have some new tools to help us work smarter, be more efficient and most importantly, better serve our customers! This change and transition is not without the bumps along the way, and we appreciate everyone’s patience as we’ve integrated the new order entry system, the online chat, and revamped our shipping services. I constantly hear from customers who share their delight with our supportive phone center, or how easy-to-navigate are webstore is, and how fast their packages arrived. We have a dedicated D'Adamo Personalized Nutrition staff, fully committed to helping our users and sharing the benefits of the Blood Type Diet and personalized nutrition with people they speak to daily. 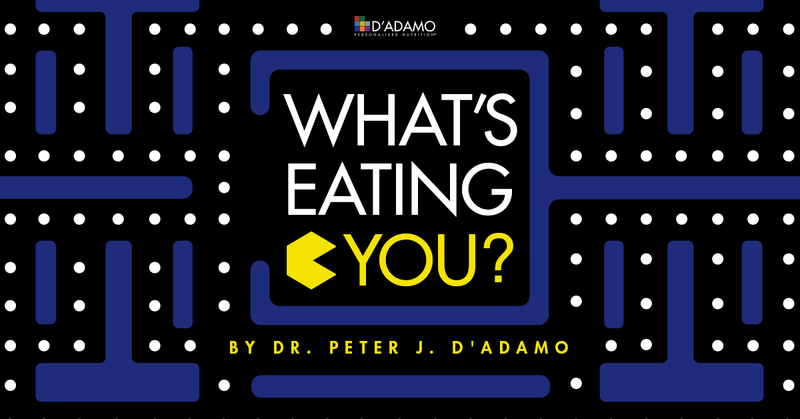 We are constantly inspired by Dr. Peter D’Adamo, our fearless visionary, who continues to lead the personalized nutrition and precision medicine revolution. In this issue, we have a short video clip of Peter talking about how blood type is as relevant today as it was 20 years ago when Eat Right 4 Your Type was first published. Whether you are a long time follower, new to the diet, or somewhere in between, I think you’ll enjoy hearing him talk about the value and importance of personalized nutrition. Enjoy the newsletter and happy fall from all of us at DPN. Autophagy, in the simplest of terms, is your body’s way of tidying up on a cellular level. Literally meaning “self-eating,” autophagy is when your cells create membranes that travel around, searching for less optimal cells and eating them up. Once they clean up these old cells, they use the materials gathered to make fresh, new ones. Think of a discarded plastic bottle. When it makes its way to a recycling facility, all crumpled and used up, the bottle gets broken down into its core components so its materials can be utilized once more and made into a fresh, perfect new version. The beauty of the human body is that it can do this entire process all by itself! What would cause a cell to initiate autophagy? Like anything else, cells wear out over time. Older cells don’t have the same vitality as they did when they were young. They can simply be less efficient than they used to be, or in some cases, they might even be diseased or broken in visible ways. While there is a process that cells can use to essentially commit suicide, why destroy something entirely when there’s valuable materials in play? Imagine if you were in a school’s woodworking class, where students attempted to build birdhouses and instead made jaunty, barely stable structures. An intelligent teacher wouldn’t go buy all new wood if it was possible to break down the poorly made structures and reuse the undamaged materials. Your body is smart enough to make this same decision. When it senses the buildup of these subpar cells, autophagy begins! Because autophagy constantly runs through your system, sweeping up old, tired cells and getting new ones made with their leftover materials, it is a key component in maintaining vitality as you age. If autophagy is functioning at full efficiency, your body will be refreshing itself internally as it ages by not letting old cells linger. It will also do a great job of detoxifying and cleaning up diseased, unhealthy cells that can emerge from all kinds of ailments. On top of these cellular level changes, well-functioning autophagy has also been linked to relieving some of the most uncomfortable aspects of aging, such as inflammation and a weakened immune system. So How Do We Make Autophagy Happen? It’s clear autophagy is a great process to have running at full steam if we want to feel young as we age, but how can we ensure it is happening within us? Since it is, on the most basic level, a response to stress, you can promote autophagy by stressing your body regularly with exercise. If you can’t exercise intensely or just want to boost your body’s autophagy function even further, there is another promising option. Trehalose can be found in many organisms ranging from bacteria to insects and even plants. One of the main things trehalose does is maintain a cell’s integrity by preventing cellular dehydration, something that happens increasingly as we age. When cells dehydrate, they lose structural integrity in ways that makes them impossible to repair. Trehalose acts like a cellular scaffold, holding the cell in the proper form so that when it is able to be rehydrated, it will be stable. The most interesting thing about trehalose isn’t just its ability to help cells resist dehydration, but its effects on autophagy itself. Even without the help of the normal cellular components that make autophagy happen, trehalose can promote the process! The takeaway from all these microscopic interactions happening within you is that the “self-eating” process of autophagy is a key part of your cellular health and something that is important to support. Doing what you can to promote healthy autophagy, like maintaining a healthy diet, exercise plan and supplementing accordingly will lead to a more full life with a less abrupt and intense impacts from aging. Having healthy cellular function will positively affect all aspects of your body, as cells are literally the building blocks that make us! If you are looking for a more in-depth, scientific explanation of the inner workings of autophagy, please visit my old N=1 blog here, where I cover the topic in detail. 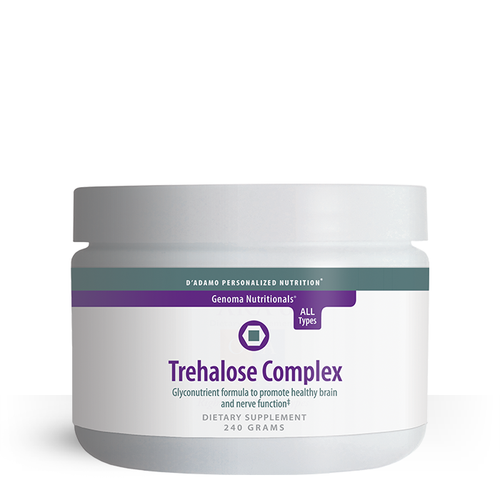 If you are looking for a product that can maintain your cellular health, look no further than Dr. Peter D’Adamo’s Trehalose Complex. It includes the same trehalose ingredient discussed above that can help cells resist the signs of aging by properly executing autophagy. Research has shown that it may help protect cell integrity against various environmental stresses like heat, cold, dehydration and oxidation. It may also help promote healthy cognitive and nerve function and provide anti-aging support to nerve tissues against environmental toxins. Being healthy at the most basic, building-block level of your body is key to keeping vitality as you age, and Trehalose Complex can be a huge helping hand in this endeavor! "I've been using this on & off for the last year and decided to finish off my container. I noticed a tremendous difference within the last two weeks of taking it! I can finally tackle papers and boxes that had been set aside for "later." Clarity to make decisions without second guessing myself. I also have a bit more energy...even with less sleep. Love it! I like to take it on an empty stomach first thing in the morning, mixed with a glass of lemon water and ARA 6 powder." I was suffering from nausea and anxiety on a regular basis for many years and my doctor began to get concerned. He let me know that I should start having more routine blood checks to make sure nothing was seriously wrong. Soon after starting these more regular visits, it became clear that my high cholesterol had a lot to do with my issues. While the doctor immediately recommended a Statin prescription, I thought I would search for a more holistic approach to calm my cholesterol. After spending lots of time on Google, I found myself on a page about The Blood Type Diet and how eating a personalized diet could help. While I hadn't heard of it before I stumbled upon it that day, the whole concept made perfect sense to me. The first thing I did was buy the Eat Right 4 Your Type Cookbook for my Blood Type, A. I loved the recipes, which had tons of variety and were both fun and easy to make. With the help of the cookbook, I was able to follow the diet religiously and never feel short-changed. I made sure to do the diet as Dr. D'Adamo recommended, trying for 80% compliance. I usually did this by being very structured during the week and more lax on weekends, but I always made sure to respect my body based on its specific needs. When I went back to the doctor after 3 months of The Blood Type Diet, my high levels of cholesterol had diminished back to normal. The doctor was amazed at how quickly I had been able to improve, especially without medication. I continue to follow the diet avoiding the foods that don't serve my body well. I can thoroughly recommend The Blood Type Diet to anyone struggling with not just weight issues, but any sort of condition. Changing your diet can have more of an impact than you think! The very talented Eric Morrison, the creator of the 4Course Youtube Channel recently sat down with Jeff and Andrea, two long time Blood Type Diet followers and asked them how the lifestyle has helped them be happy and healthy. You can find the full interview here! "We all deal with fatigue differently, and many of our bodies' responses are based on our unique, individual biochemistry. 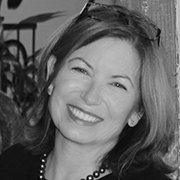 The Blood Type Diet provides an individualized plan for optimizing health and wellness. I've tailored four specific protocols as targeted support for individuals who experience deep fatigue as a primary or secondary health concern." The fall is a majestic season to admire, in a coat of red, orange and yellow. It reveals new crops and warming flavors. Stretching into the winter, pumpkin season is in full bloom. Pumpkins are members of the gourd family, which includes muskmelon, watermelon and squash. Its orange flesh has a mild, sweet flavor and the seeds, also known as pepitas, are delicately nutty when husked and roasted. Some pumpkin varieties can weigh well over 100 pounds and in general, the flesh from smaller sizes will be more tender and succulent. Choose pumpkins that are free from blemishes and heavy for their size. Store whole pumpkins at room temperature up to a month or refrigerate up to 3 months. *Pumpkin is an avoid for blood type B secretor. Replace Pumpkin with butternut squash. Heat the vegetable broth over medium heat in a saucepan. Peel and finely mince the shallot. In a medium sized pot, melt 1 tablespoon of ghee over medium heat. Cook the shallot until translucent. Season with a little salt. Add the rice and mix to coat it well in the ghee and shallot. Gradually add the warm vegetable broth, a ladle at a time, mixing well. Add broth every time it is absorbed, stirring constantly. This process should last about 20 minutes. If you are making homemade pumpkin puree, chop the pumpkin skin-on in chunks and steam until cooked through and tender. The skin will come off easily. 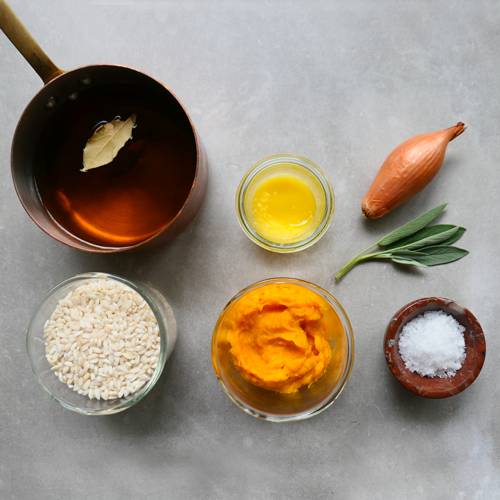 Transfer the cooked pumpkin to a food processor and pulse until mashed and creamy. This process shouldn’t take more than 5-10 minutes if the pumpkin is cut in small or medium-sized pieces. If you are using pure canned pumpkin purée, simply measure it out. When the rice is almost done, stir in the pumpkin puree until well combined. Season to taste with the salt and pepper. Remove from the heat. In a small pan, heat 1 tablespoon of ghee over medium-high heat for about a minute. When it is hot, fry the sage leaves until crispy. 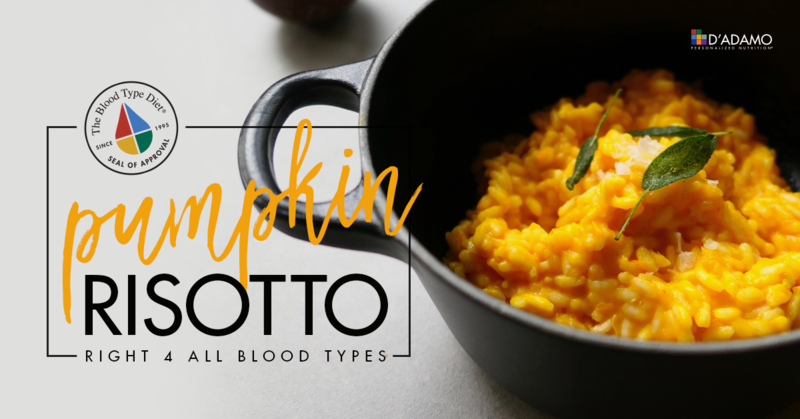 To serve, plate the pumpkin risotto, sprinkle some Pecorino on top and drizzle the hot sage infused ghee over it to melt it. Enjoy hot!